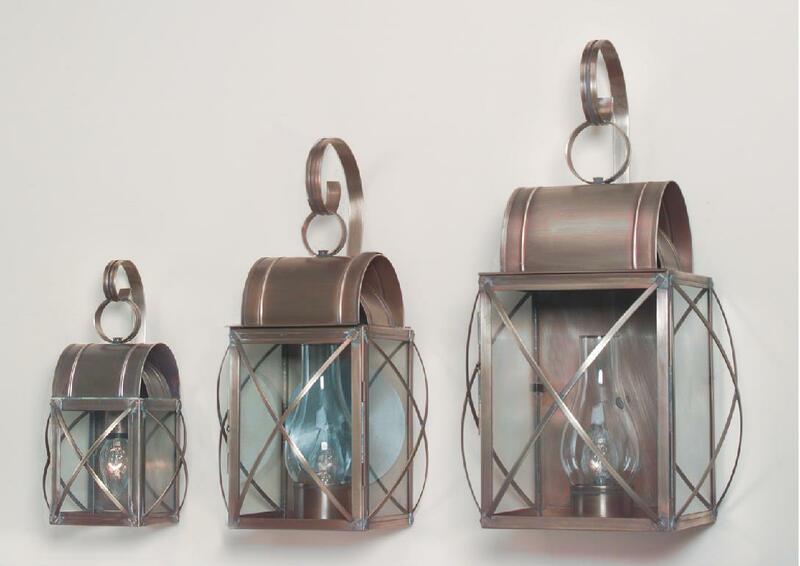 This selection of Colonial Outdoor Copper Wall Lanterns is offered in a variety of sizes. They coordinate with matching handcrafted reproduction Post and Hanging Lights. Hammerworks Colonial Outdoor Copper Lights, Culvert WC 106 is a great choice if you want a primitive, country look. Most importantly, we handcraft these Colonial Wall Lanterns in three sizes. Therefore, you can mix and match your lantern choices with ease. Also, the rustic styling of these Colonial Exterior Copper Lanterns is ideal for a variety of home designs. While the smallest model WC106A is only available with a single bulb shining down, we can substitute an optional candle cluster in place of the standard single hurricane globe shown in the two larger models. 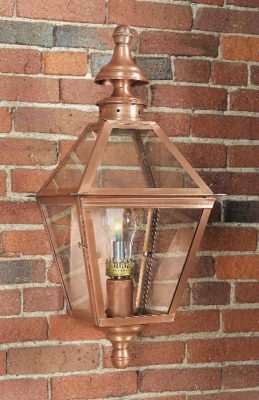 Especially relevant, in contrast to the primitive style of Colonial Outdoor Copper Lights, we offer a variety of Traditional Outdoor Wall Lanterns. Certainly one attractive option is the New England Traditional Wall Lantern Small Coach WM105A. This unique six sided classic exterior wall sconce is also available in the larger model, WM105. In addition, we offer the coordinating New England Style Colonial Post Lantern Large Coach P105 and the Colonial Style Hanging Lantern Coach H105A. Both of these styles are also available in two sizes. Likewise, Hammerworks offers several Colonial Post Lanterns in both primitive and traditional styles. Most importantly, the Cape Cod Post Lantern Culvert PC107 or PC106 match perfectly with the Culvert Wall Mount series. 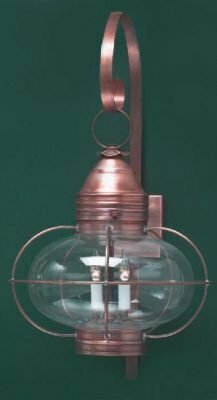 However for a nice contrast, consider the Colonial Post Lantern Small Sturbridge P102 or its larger counterpart, the Colonial New England Style Copper Post Lantern Large Sturbridge P101. The classically simple appearance of these Colonial style post lights complements any home design. Take a moment to browse our website to find your favorites.